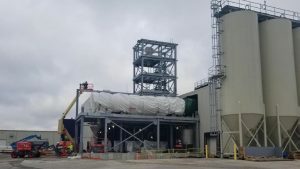 This Ohio malt producer needed to expand their existing malt production facility to install a new vacuum belt spray dryer, new packaging equipment, new product receiving and blending equipment, new MCC room and new office and break areas. This project included conceptual, preliminary and detailed engineering phases, as well as construction cost estimates, engineering assistance during construction and start-up and commissioning assistance. Engineering and design were done on a fast-track schedule and took 8 1/2 months to complete. Began structural design while equipment and vendor selection was still being finalized. A strategic design approach was taken in order to continuously adapt to evolving information while also limiting rework. Converted the existing Starch Warehouse area into a new blending area. This included foundation work for new blend tanks, a new 450 square foot, 2nd floor, elevated concrete slab at the north end of the dryer, 300 square feet of access platforms with stairs and a new dividing wall on the east side. New dryer building foundation, including required design modifications to existing LME building and truck dock foundations. New dryer building ground floor slab design, including the packing line equipment supports, pump station design, a number of tank supports and access platforms. New dryer building 2nd floor elevated concrete slab, including concrete piers supporting the new dryer, office/break areas, a new 600 square foot MCC room and support for a new condenser unit. Structure to support a new one cell cooling tower on the roof. New 5 level product receiving tower with an elevated concrete floor slab at each level and each level sealed for cleanliness. All new construction was designed to be “clean” for to help facilitate sanitary food processing. Thirty structural CAD drawings were issued.